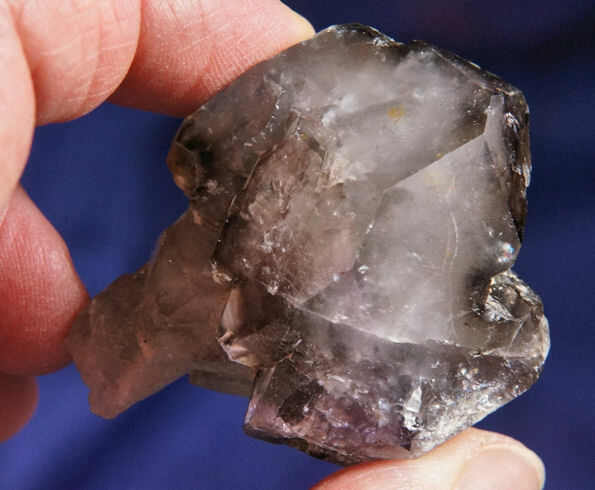 This is an intriguing, elestial 1.7 oz smoky scepter with a touch of amethyst, 1.9” by 1.55” by 1”, from Aricuai, Brazil. Her back contact area and an old ding are healed and her crown is relatively large compared to the slender, frosted rod. The smoky color is concentrated in her terminations and she is largely misted within her. Her faces and sides hold an abundance of subtle glyphs but you will need a loupe to see them well. She is a stunning and unusual Spirit, anxious to meet her true Keeper! She holds a special kind of vibration and symbolizes the etheric and Spiritual enlightenment as expressed in physical expression. This is a natural shift for all the Spiritual advancement in the world is meaningless unless you can mesh it with the physical world in which we were born. I call her a ‘sacred visions’ Spirit because as soon as you touch her, you will be off together. She has a heady crystalline musk, so anoint her with rainwater to enhance the visioning process and sit in one of your favorite sacred spots. She has a preference for the outside where birdsong creates a symphony of sound and vibration. Choose a side and focus on the glyphs before you. They are messages from times past and ancient wisdom needed today. Beyond this, she would open no further, saving the true message for her One Keeper.